WFAA8 had a nice, solid 10 p.m. newscast going for it Monday. But then the clown car rolled in and, well . . .
For the next five weeknights -- assuming stamina allows -- we’re again going to telescope the ratings “sweeps” content of Fox4’s 9 p.m. edition and the 10 p.m. offerings on NBC5, WFAA8 and CBS11. Why? Because it’s instructive to see what they’re all doing -- both the good and the bad. 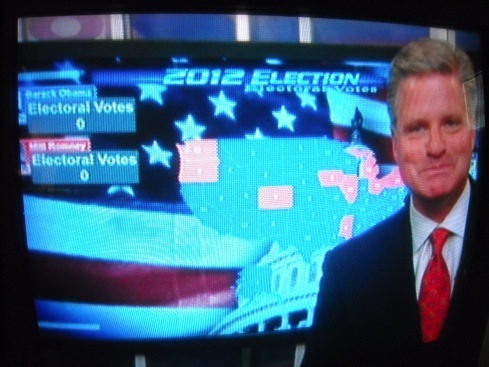 On WFAA8, weathercaster Pete Delkus obviously is still working the kinks out of his new electronic map. This is much to the amusement of sports anchor Dale Hansen, who guffawed loudly off-camera Monday night when Pete’s highs and lows suddenly gave way to a 2012 presidential election electoral map. It’s hard to do that. It’s also increasingly hard to know whether station management perceived it as another great TV “moment” that will have people talking -- or just a flat-out big embarrassment. Whatever the case, WFAA8 won big in Monday’s Nielsen ratings over arch-rival CBS11. Delkus-Hansen antics long have been almost a nightly staple of WFAA8’s late nighters, although this particular screw-up should make a number of national blooper reels. Whether it devalued the newscast as a whole is debatable. But it certainly re-directed any morning-after “water cooler” talk. Earlier in Monday’s newscast, Slater had an affecting followup story on Alexandra Goode. She’s a nearly 90-year-old concentration camp survivor whose life mission -- after finding God anew -- is a Russian Orphan Exchange program that has rescued some 250 kids, many with serious facial deformities. Some of them affectionately call her “Babushka.” And although the accompanying mood music got a bit sticky at times, this was a story well worth telling. And Slater told it well. Reporter Teresa Woodard also had an interesting piece on Plano’s upcoming mayoral election between two black candidates. That will be a first for Plano, still perceived by some as white and affluent with perhaps an over-blown sense of entitlement. All four stations pounced on Atmos Energy’s inadvertent over-charges of some 39,000 auto-pay customers in eight states, including Texas. All of their monthly bills were multiplied 10-fold. Both WFAA8’s Jason Wheeler and Fox4’s Natalie Solis noted the inherent problem of paying via a debit rather than a credit card. Debit card payments are immediately subtracted from a customer’s checkbook balance, which can make over-charging all the more burdensome when other monthly bills are paid in the same manner. It was a key component of the story, but NBC5’s Tim Russell and CBS11’s Andrea Lucia failed to mention this in their 10 p.m. reports. It was a particularly tough night for debit cards on Fox4, where reporter Shaun Rabb also cited their drawbacks in his well done story on a skimming operation in which PIN numbers were stolen from customers who paid at the pump. Crooks operating out of a New York hotel then drained the checking counts of their prey. Rabb told viewers that credit cards -- or using the credit option on a debit card -- do not play into thieves’ hands because no PIN numbers are involved. Fox4 led its 9 p.m. newscast with Brandon Todd’s lengthy report on the abduction and sexual assault of a 14-year-old Richland Hills girl by a 26-year-old man who also had been arraigned on a similar charge in Ohio. Contreras met Stephan Cox via a social media app, and ultimately agreed to meet him after school. They were together for a week, during which she feared for both her and her family’s safety, according to Contreras. “I was scared. I mean, I was scared from the start,” she told Todd. Co-anchor Heather Hays praised Contreras as a “very brave girl to share her story” (which she likewise shared with CBS11 reporter Brian New in a shorter account). It’s good that she was rescued by police and is back home safely. Still, both stories lacked even a smidgen of skepticism as to how Contreras could be so naive -- and why she took a presumably public bus ride to El Paso with this guy even after being “scared from the start.” Her father appeared briefly in both stories to say how happy he is to have his daughter back. Her takeaway from this experience: “Do not talk to any strangers at all,” she told Todd. Fox4 also had another weekly installment of veteran reporter Saul Garza’s “What’s Buggin’ You?” This time he came to the aid of a mobile home dweller in Alvarado who objected to an Oncor utility pole that seemed to be leaning very precariously over her fence. As often happens, Garza made a call and the problem was fixed after more than a month of neglect in this case. He’s not shy about touting himself, or letting those he helps out sing his praises. But hey, the guy does get results, and this is one of the D-FW market’s best long-term news features. NBC5 led with an extended story by “consumer specialist” Deanna Dewberry, who’s also become a standout in this field since her re-arrival last fall. Dewberry, who previously spent seven years with WFAA8 and sister cable news network TXCN, had an intriguing look at the differences in tempered and laminated glass. In the case of a submerged vehicle, the former is easily broken while the latter is virtually impregnable. But automakers increasingly are turning to laminated glass for side windows -- largely because it keeps cars quieter, is more energy-efficient, can thwart break-ins and is more durable in rollover accidents, Dewberry said. She tied her story to the November 2012 drowning deaths of a mother and her toddler daughter, with a small portion of their 911 call for help played while the auto they were in sunk deeper into a pond after being involved in an accident. Dewberry also interviewed the two young men who tried to rescue the pair before she ended the piece with tips on how to tell if your side car windows are tempered or laminated. It was a well-told story with useful information. No matter. A lone hamster in attendance would have been good enough when the objective is to promote your network’s most popular show, The Voice. And one of the surviving contestants down the home stretch is Rockwall High grad Amber Carrington. No one remained by the time Villafranca did his live standup. But “they were very proud, Brian,” he assured. Fox4 has long taken the same tack with American Idol, and would be doing so again if any of the finalists were within even a sniff of North Texas. But such reports can be painful -- particularly for the poor reporter. “We are all pulling for Amber. That’s for sure,” Curtis added at story’s end. Well, not really. WFAA8’s Campos also got in a mention of Dallasite Sean Lowe, star of the most recent The Bachelor and now fighting for his life on ABC’s ongoing Dancing with the Stars. But there was no attendant watch party -- or at least none the station attended.